This is a design I came up with for a 1 sheet, flat bottomed, double paddle canoe of "instant" construction. I took the lines off of Rushton's "Sairy Gamp" as much as possible in this different form. Its a bit shorter. It makes a GREAT kids boat, for a child in the 50-90 lb range. I do OK in it at 160 lbs, but its a bit tippy. Rushton designed "Sairy Gamp" for George Washington Sears in the late 19th century. Sears, writing under the pen name "Nesmuk", wrote about his experiences paddling very small streams in upstate New York. 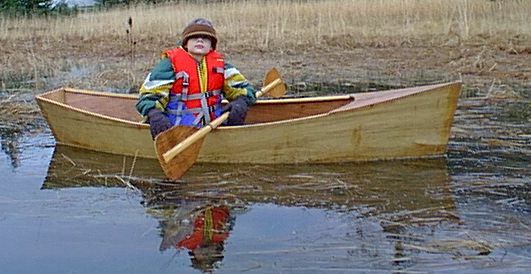 He needed a craft that he could portage with his rather frail (110 lb) body. 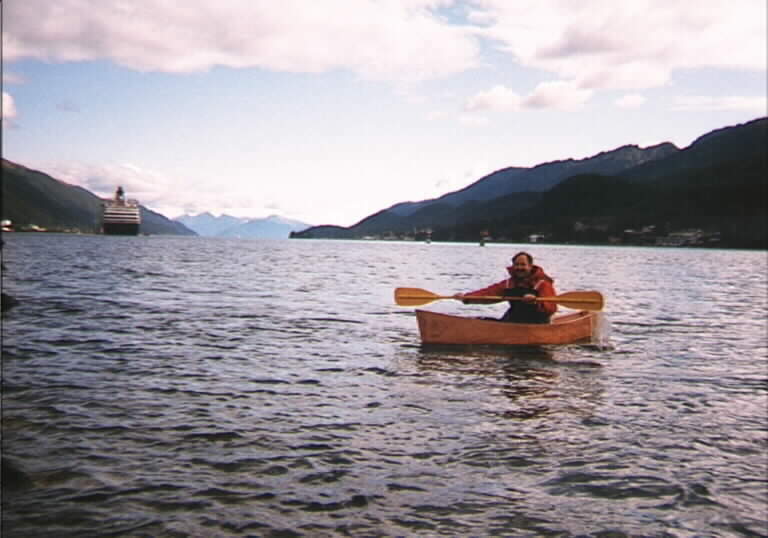 I used this boat to fulfill I goal I set 9 years ago upon moving into my home: carrying a boat to the end of my block, launching and paddling out to salt water in very small Switzer Creek. Switzer Creek is at points less than 30" wide (as I soon discovered), and at the limits of tidal influence. As it was, my 8 foot craft hung up on several of the sharp hairpin corners, but I was able to free her by crabbing along the bank with my hands. A boat 2 inches longer could not have made it! I timed the tide so I would just get a little extra lift at the launch point, but make it out and through a couple of under-highway culverts before the tide got too high. It was a grand expedition on a crisp sunny autumn day, and the boat met or exceeded my expectations in a grand way. The goal for this boat was "1 sheet, 1 weekend", that is design the boat, build it, and launch it by the end of the weekend. OK I cheated, building it over a 3 day (Labor Day 1998) weekend, but I didn't start until Saturday. Robert Laine's hull design software helped some, but there is a lot of twist in the side panels. Still, working with 1 sheet, there isn't all that much latitude for form variation. The boat was launched in Twin Lakes at 11:30 pm Monday evening of the 3 day weekend, last coat of IPN varnish still a bit tacky (it turned milky again, as when you apply it, but cleared up fine after a few days). I'm using this design to explore boatbuilding with kids. My son Joe (age 7) and I have built a second one, and I'm contemplating building a kids curriculum around the project. I also came up with a quick Kayak paddle design for the project, using readily available, inexpensive materials. Joe paddles up Switzer Creek in his boat, at high tide.